Frankfort, Kentucky’s capital city is nestled among the rolling hills of the Bluegrass Region, in the beautiful valley of the Kentucky River. Its historical significance and varieties of architecture, museums, shops, and famous landmarks highlights of Frankfort. From the Inn, turn right onto U.S. 127 north. Follow U.S. 127 north to Frankfort. Frankfort is approximately 33 miles from Beaumont Inn bed and breakfast. 1001 Wilkinson Blvd. 2 miles from downtown Frankfort. The oldest continuously operated distillery in Kentucky with buildings dating to 1792. Free tours on the hour, which include warehouse, barrel dumping and hand bottling operation. 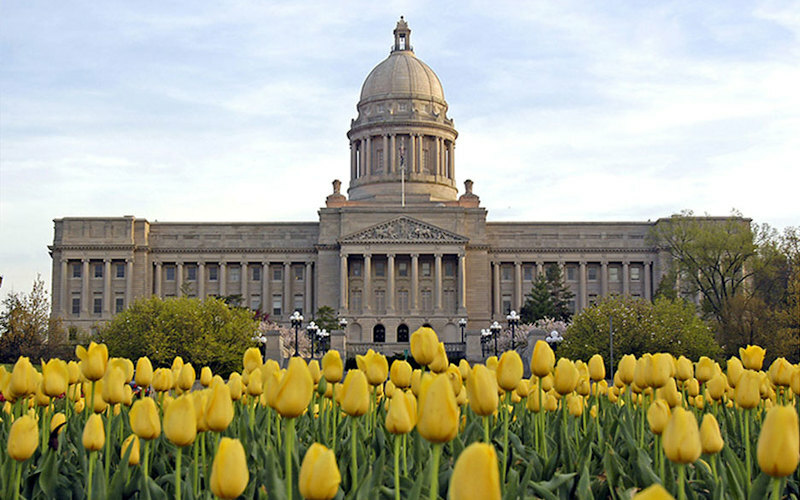 Frankfort holds one of the most beautiful capitols in the country. Completed in 1910, the Beaux Arts design features 70 ionic columns, decorative murals, and sculptures of Kentucky dignitaries. Also, the First Lady Doll Collection and changing history and culture exhibits are featured on the first floor. Overlooking the Kentucky River is the official Governor’s residence. The Beaux Arts Mansion, constructed of native limestone, was modeled after the Petit Trianon, Marie Antoinette’s summer villa. Exhibits depict the military history of Kentucky with emphasis on Kentucky National Guard and Militia. Featured are weapons, uniforms, flags, photographs, and Civil War artifacts. National Historic Landmark. Greek revival structure completed in 1831. Unique self-supporting, circular staircase is held together by precision and pressure. Next door is the Kentucky History Museum. Social history in Kentucky from settlement period to 1900’s. “Kentucky Journey” exhibit follows the phenomenal journey from prehistoric Kentucky to our present day Commonwealth. Great book store filled to capacity with new and used books. One could spend the day here! After a day in Frankfort, return to our historic Kentucky bed and breakfast for fine food and drink.